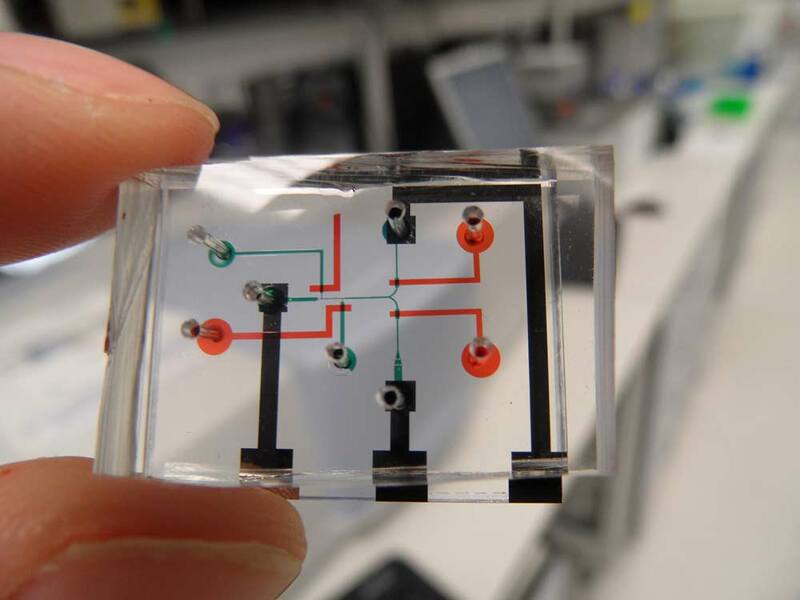 Microfluidic devices facilitate trapping, immobilisation, imaging and behavioural analysis and are particularly well suited to the development of platforms for microscopic nematodes. We have designed and fabricated new integrated devices that combine capability for trapping, immobilisation and compound perfusion with discrete electrophysiological recording of the neural activity in networks that regulate neuromuscular activity in the nematode pharyngeal system. NeuroChip captures electrophysiological signals from the pharyngeal system of C. elegans. It has been likened to a worm ‘EEG‘. The signal acquired is called the electropharyngeogram or EPG. It provides signatures that correspond to excitatory and inhibitory neural signalling. The EPG has proven utility for characterising the mode of action of drugs such as ivermectin and emodepside. The EPG waveform reflects the net output of a microcircuit of 20 neurons. This circuit harbours a plethora of neurotransmitter receptors and channels which represent major targets for human medicines and anthelmintic drugs and through which drug toxicity may also occur. Electrophysiological recording has the advantage that it provides an exquisite level of detail and resolution e.g. in terms of specific receptors and ion channels that mediate the requisite effects. NeuroChip permits high resolution analysis of neurological signals from C. elegans overcoming limitation of conventional electrophysiological techniques and can be employed for chemical screening. NeuroChip works by trapping the nose of the worm in an aperture forming a tight seal around the body. This electrically isolates the front and back of the worm. Integral electrodes detect the potential difference between the two regions generated by the neuromuscular activity of the pharynx, which leads to an electrical signal and a read-out for the activity of the pharyngeal neural network. The device has been optimised to measure electrophysiological signals from larval stages of C. elegans and is suitable for recording from smaller species of parasitic nematode. The NeuroChip device works by trapping the nose of the worm in an aperture forming a tight seal around the body. This electrically isolates the front and back of the worm. Integral electrodes detect the potential difference between the two regions generated by the neuromuscular activity of the pharynx, which leads to an electrical signal that provides a ‘read-out’ for the activity of the pharyngeal neural network. An innovative platform for discrete analysis of plant parasitic nematode host plant invasion behaviour. The oesophogeal-stylet system of the plant parasitic nematode is integral to its parasitic life style. StyletChip has been designed for imaging and recording of stylet thrusting and oesophageal pumping. StyletChip permits trapping, imaging, electrophysiological recording and perfusion of chemicals and provides a new tool to investigate the bioactivity of chemicals on behaviour vital to parasitism.